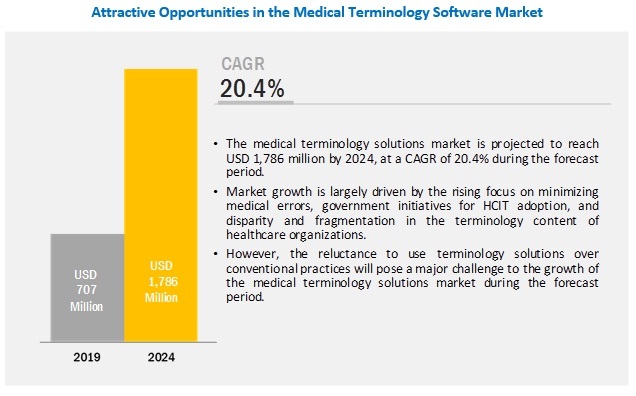 [138 Pages Report] The medical terminology software market is projected to reach USD 1,786 million by 2024 from USD 707 million in 2019, at a CAGR of 20.4% during the forecast period. The growth in this market is driven by factors such as the rising focus on minimizing medical errors, government initiatives for HCIT adoption, and disparity and fragmentation in the terminology content of healthcare organizations. On the basis of application, the data aggregation segment accounted for the largest share of the medical terminology software market in 2018. The large share of this segment can be attributed to the growing focus on reducing medical errors and the need to create a consistent and comprehensive data source and improve performance measurement and transparency in patient care. On the basis of product & service, the services segment accounted for the largest share of the medical terminology software market in 2018. The large share of this segment can be attributed to the increasing demand for the standardization of patient data and the rising need to curb medical errors and accumulation of large amounts of healthcare data. Geographically, the medical terminology software market is segmented into North America, Europe, Asia Pacific, Latin America, and the Middle East & Africa. The large share of North America is attributed to the high adoption of HCIT technologies, regulatory requirements regarding patient safety, the presence of leading market players in the region, and growing demand for accurate data exchange between healthcare providers and payers to streamline workflows. Prominent players in the medical terminology software market are Wolters Kluwer (Netherlands), Intelligent Medical Objects (US), Apelon (US), Clinical Architecture (US), 3M (US), CareCom (Denmark), Bitac (Spain), B2i Healthcare (Hungary), BT Clinical Computing (Belgium), and HiveWorx (Ireland). Intelligent Medical Objects is the leading player in the medical terminology software market. IMO develops, manages, and licenses medical terminology and HCIT software applications that allow clinicians to capture clinical intent at the point-of-care. IMO offers an enterprise platform that hosts its dictionaries and services to meet the day-to-day terminology needs of its customers. It serves as the foundational platform for healthcare enterprise needs, including clinical documentation and population health management. IMO terminology is used by more than 4,500 hospitals and 500,000 physicians daily. The company’s terminology software is used to capture clinical intent and help preserve and communicate complete patient information across the entire spectrum of care. In 2018, Clinical Architecture (US) launched Symedical on FHIR, its latest in Healthcare Content Management. In 2018, CareCom (Denmark) and Tieto (Finland), an IT software and service company, signed a strategic partnership solving the challenge of semantic interoperability for healthcare IT systems. Under this partnership, the companies intend to strengthen the cooperation and product offering for CareCom’s terminology platform, HealthTerm. In 2016, Wolters Kluwer (Netherlands) announced a partnership with Health Core, Inc., (US), a clinical outcomes research subsidiary of Anthem, Inc. (US), to provide data normalization services to the California Integrated Data Exchange through its health language enterprise terminology management platform. Who are the top 10 players operating in the medical terminology software market? What are the driving factors, opportunities, and challenges in the medical terminology software market? What are the industry trends and the current scenario of the medical terminology software market? What are the growth trends in the medical terminology software market at the segmental and overall market levels? What are the growth potential and current market size for major geographies in the medical terminology software market? This study involved four major activities to estimate the current market size for medical terminology software. Exhaustive secondary research was done to collect information on the market, the peer market, and the parent market. The next step was to validate these findings, assumptions, and sizing with industry experts across the value chain through primary research. Both top-down and bottom-up approaches were employed to estimate the complete market size. Thereafter, market breakdown and data triangulation procedures were used to estimate the market sizes of segments and subsegments. In the secondary research process, various secondary sources such as annual reports, press releases & investor presentations of companies, white papers, certified publications, articles by recognized authors, trade directories, and databases such as D&B Hoovers and Bloomberg Businessweek were referred to in order to identify and collect information for this study. The medical terminology software market comprises several stakeholders such as medical terminology software vendors and end users. Primary sources from the supply side include CEOs, vice presidents, marketing and sales directors, business development managers, and innovation directors of medical terminology software companies. Demand-side primary sources include industry experts such as directors of hospitals directors, hospital vice presidents, HCIT managers, and related key opinion leaders. After arriving at the overall market size-using the market size estimation processes as explained above-the market was split into several segments and subsegments. In order to complete the overall market engineering process and arrive at the exact statistics of each market segment and subsegment, data triangulation and market breakdown procedures were employed, wherever applicable. The data was triangulated by studying various factors and trends from both the demand and supply sides.